Urbanears is known for building headphones that are relatively stylish and comfortable, and for good reason. We’ve reviewed headphones from the company before, and quite liked a lot about them — but found that their sound quality left a little to be desired. Now, we’re taking a look at a different pair — the Urbanears Plattan 2 Bluetooth headphones. Are the headphones worth buying? We put the Urbanears Plattan 2 Bluetooth headphones to the test to find out. As mentioned, Urbanears is known for building pretty stylish headphones, and the Urbanears Plattan 2 Bluetooth headphones are no exception to that rule. The headphones are available in a range of different colors, including black, gray, blue, red, white, and pink. 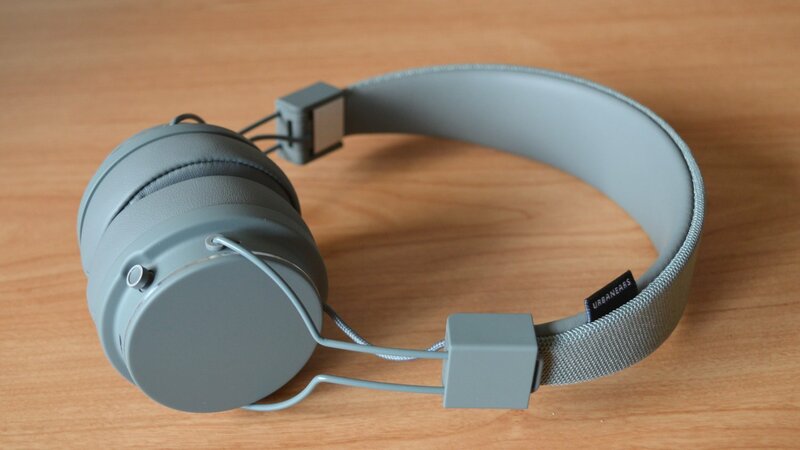 We’re reviewing the gray version of the headphones, and they look great. The headphones are very light, which we quite like. Often when headphones are super light, they end up feeling cheap, and while that is a little the case here, the headphones are clearly built from premium materials that should be able to withstand most abuse you can throw at them. On the left ear cup, you’ll get an aux port, while on the right there’s a MicroUSB charging port. We wish Urbanears would have adopted USB-C here — it’s time to adopt the new standard. On the right ear cup, there’s also a control joystick like the one on the Urbanears Jakan headphones. We found the joystick to be relatively easy to use, though it will take a little time to get used to. One of the nice things about the headphones is that they fold up, which clearly means that they’re meant to be portable. Only problem is, there’s no carry bag or case, which is a little disappointing. You do get a MicroUSB charging cable, but that’s about it. As mentioned, the Urbanears Plattan 2 Bluetooth headphones are very lightweight, and that helps a lot when it comes to comfort. There’s not much padding in the headband of the headphones, but because of the fact that the headphones are so light, they don’t really need much padding anyway. Around the ear cups, thankfully, there is plenty of padding. we found it easy to wear the headphones for extended periods of time, even despite the fact that they are on-ear headphones, which sometimes can suffer in the comfort department. Urbanears headphones sometimes have a tough time with sound quality, but thankfully, the Urbanears Plattan 2 Bluetooth headphones sound quite good. They probably aren’t the headphones to buy if you’re an audiophile, but considering the fact that they come in at $50, they have a lot going for them. Let’s start with the bass, which doesn’t have a ton of extension. Thankfully, the bass that is there doesn’t sound bad — there’s a good punch in kick drums, and bass guitars sound fine. The midrange is decently tuned too. Low mids are present and warm, while there are plenty of high mids to help things like vocals and guitars cut through the mix. Despite the fact that these headphones are relatively inexpensive, the high end still sounds quite good. There’s not as much clarity as some may want, but for headphones in this price range, the high end sounds great. There are a few other issues with the sound quality, but nothing too damaging. We found that they seemed to distort pretty easily, which can be a little frustrating. The soundstage is also a little cramped, but again, it’s not a huge issue in this price range. The Urbanears Plattan 2 Bluetooth headphones connect to your listening device through an unspecified version of Bluetooth, and it’ll get you a range of up to 10 meters or 33 feet. The battery life on the headphones is up to a massive 30 hours, which is very impressive. 30 hours is far more than the average of on-ear headphones, so if you’re someone who often forgets to keep things charged up, these might be the headphones for you. The Urbanears Plattan 2 Bluetooth headphones have a lot going for them. They’re relatively well-designed, quite comfortable considering their light built, and they sound good for headphones in this price range. In fact, considering the headphones’ excellent value-for-money and comfortable build, we don’t think there are any better on-ear headphones for the price. And, because of that, we’ve awarded the headphones the Headphone Review Silver Medal. You can get the Urbanears Plattan 2 Bluetooth headphones for yourself straight from Amazon.